Would you fly in a plane with no instrumentation? Would you be comfortable if the pilot determined their positioning and how the engines were running solely using their gut feeling and experience? Chances are the answer to this question is “NO”! Yet many businesses and projects operate this way every day. A Balanced Scorecard keeps your business on track to success. This week I was working with our team on updating the Balanced Scorecard for our three businesses BRS, easyconsult and easygovernment. During this process, I realised just how important a Balanced Scorecard is to the day-to-day management of these businesses and ultimately to their success. It should not be viewed as merely a tool to be used, but rather a fundamental part of the structure of your business—indeed it is the mechanism which turns the goals from your strategic plan into reality. 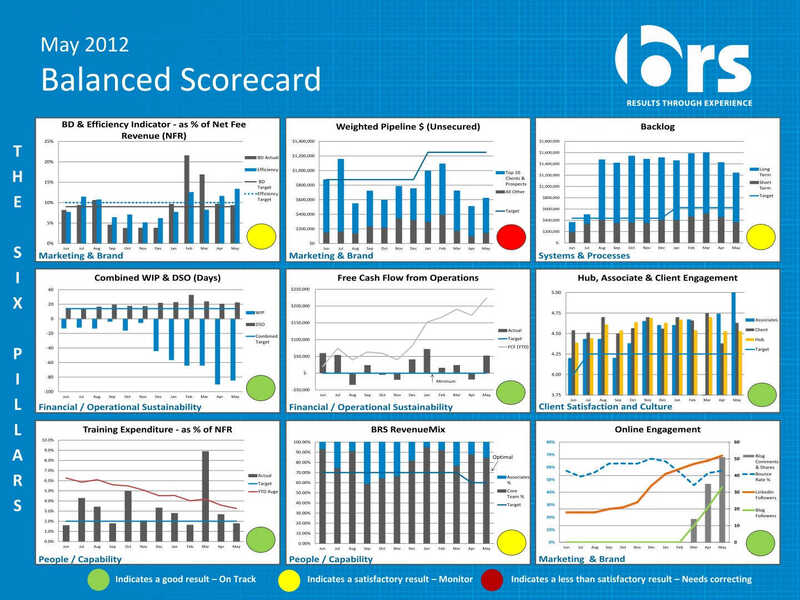 So what exactly is a Balanced Scorecard? Balanced Scorecards contain a mix of key measures which provide trends on leading and trailing (lag) indicators on periodic basis (e.g. weekly, monthly, and quarterly). The mix of measures reflect the strategic goals and targets of your business or project, linked back to your core business pillars for example Marketing & Brand; Systems and Processes; Financial/Operational Sustainability; Quality and Functionality; Safety; Client Satisfaction and Culture; and People/Capability. Generally between 9 and 12 key measures are identified in the Balanced Scorecard. Some examples of key measures include: Weighted Pipeline; Short-term and Long-term Backlog; Revenue Mix between Contractors and Core Team; Online Engagement; Speaking Engagements; Revenue Breakdown Between Businesses; Days Sales Outstanding; Repeat Work and Referrals; and Proposal Success Rate just to name a few. There are four key reasons why you should use a Balanced Scorecard in your business. It is a real time measure of both qualitative and quantitative lead and lag indicators of key business drivers. This is extremely important as often it is much easier to measure financial results than it is to measure progress in other essential areas (such as staff satisfaction). This leads to an over-reliance and over-emphasis on financial measurement of performance. This can be the downfall of a business as financial results are really the symptom and the output, but not the root cause of business performance. The Balanced Scorecard promotes alignment between individual objectives and business or project objectives. It ensures alignment of the performance measures used to reward and recognise staff and key stakeholders. It promotes proactive, as opposed to passive, resolution of issues around your strategic objectives. In short, it allows your business to measure, report, respond and provide timely corrective actions to ensure your business is always on “track” to meet its strategic objectives through its key strategic drivers. It facilitates the improvement of the performance of a whole organisation, a large department or a small team in an integrated way. Stayed tuned for more information in an upcoming blog on how to use and implement a Balanced Scorecard in your business! If you want further information or would like our assistance in developing and implementing a Balanced Scorecard, please contact us on +61 (0)8 8215 0332 or email us at enquiries@brsresults.com. Kym Williams will also be speaking at the upcoming Breakthrough4Business conference on 22 – 23 August 2014 where he will go through the Balanced Scorecard in detail.